AHF • AHF Supports Long Beach Pride! AHF Supports Long Beach Pride! LONG BEACH (MAY 22, 2017) — AIDS Healthcare Foundation (AHF), the largest global AIDS organization, joined the Long Beach LGBTQ community in celebrating the 2017 Gay Pride season through its planned participation in two dozen Pride events across the country. Founded in Los Angeles as AIDS Hospice Foundation in 1987 to provide a facility for the terminally ill AIDS patients in California, AIDS Healthcare Foundation celebrates its 30th Anniversary this year and continues to support LGBTQ equality and the expansion of health care services to treat people living with HIV/AIDS. At festivals throughout the 2017 Pride season, AHF will provide free condoms, information on STD prevention and treatment, and host free HIV testing at Pride celebrations nationwide. AHF tested over 1,200 attendees at Long Beach Pride this past weekend. 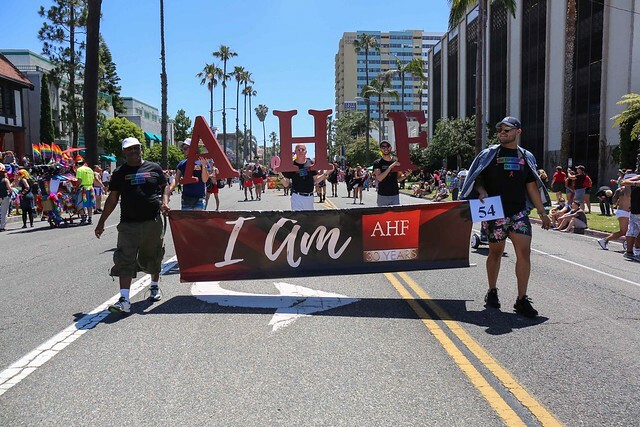 At Saturday’s Long Beach Pride parade, AHF patients, staff, volunteers and members of Impulse Group carried “I am AHF” banners, letters that spelled out AHF and OTC (Out of the Closet) and marched along AHF’s signature “One Community, One Love” Pride wrapped with smiling faces that represent the diversity of LGBTQ individuals and families. The bus is scheduled to appear in Pride parades in U.S. cities including Los Angeles (6/12); Washington, DC (6/10) Houston (6/24); New York City, NY (6/25); San Diego (7/15); Oakland, CA (9/10); Atlanta, GA (10/14); and Las Vegas (10/20).